We propose an original way to organize your closet. As with all proposals for re- cycling most important is to have the material. In this case you can ask the bike shop you frequent and sure it will be easy to get-the. They are road bike wheels, the harder it will get them in different colors, but you can always paint it to your liking. The manufacturing process is as easy as obvious. 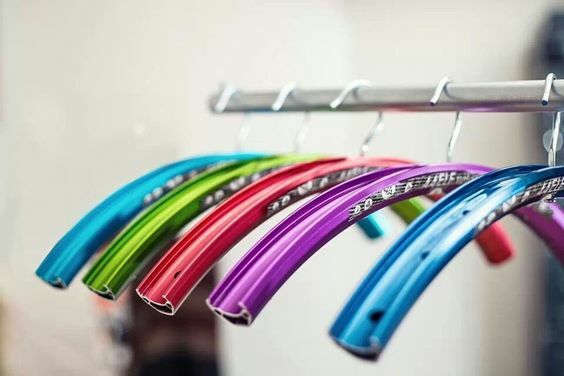 You must have tires to suit you most want to hang your shirts or jackets and harness the hole spokes to place the part that acts as a hanger. This can recycle old hangers. Subjección method with the rim depends on what you want to complicate, the easiest way is siliconarlo, It is a bit chapuzera but works well and can take the weight of clothes.